BÀ RỊA-VŨNG TÀU — At about 5pm on the last day of January, 24-year-old Nguyễn Đức Hiển from An Giang Province jumped off a fishing vessel as it was getting ashore near Cát Lở Port in Vũng Tàu City. After being rescued by another fishing boat and handed over to the border guards of Bà Rịa-Vũng Tàu Province, Hiển revealed that he was tricked by a xe ôm driver in HCM City and sold to the leader of a labour trafficking ring for VNĐ3.5 million (US$154). After being forced to sign a ‘loan document’ that made him a ring leader’s debtor, Hiển was taken to rest in a small motel room with some other people. A few days later he was taken to a fishing vessel that was about to sail, and forced to work on the vessel for a month. When the vessel was returning from the sea, its manager told Hiển that the trip was not successful enough to pay him and other labourers. Hiển decided to escape. “If I hadn’t jumped off that boat I would have been locked away by now, beaten and forced to work on another boat,” Hiển told the Thanh Niên (Young People) newspaper. “With the unreasonably high prices that they charged us for food and drink and the interest they charged for their ‘investment’ in us, we will never be able to pay off our debts,” he said. 25-year-old T. from Sóc Trăng Province was also tricked by a xe ôm driver at the Miền Tây Coach Station in HCM City, taken to Vũng Tàu City and sold to an illegal labour mediator named Loan. 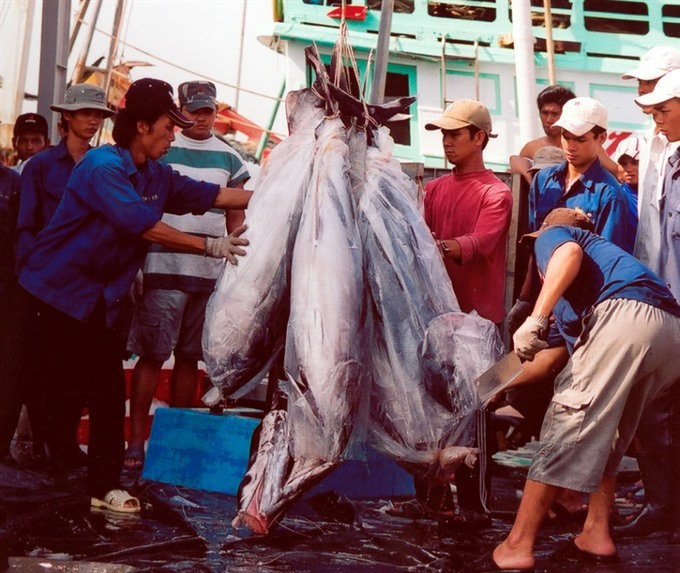 After being sold for labour trafficking rings at VNĐ2-3.5 million ($88-154) each, the labourers are resold to owners of fishing vessels for some VNĐ10-12 million ($440-527) each, said H., an illegal labour mediator in the area of the Bến Đá Port. Labourers do get beaten, and the situation has been going on for years in the Phước Tĩnh and Long Hải communes, and the Cát Lở Port, he said. P., a long-term resident of the Cát Lở Port area, said that the “most chaotic” periods when violence occurs often are at the end of the year, when the fishing vessels return from the sea, and at the beginning of the year when they are about to sail again. “In mid-March, residents of the area near Alley 999 on 30/4 Street were scared to death when a street gang chased and threatened to stab a labourer that tried to escape,” he said. “Some labourers have even jumped from the second floor to escape,” he added. Apart from the Cát Lở Port, several labour trafficking gangs also operate near the Bến Đá and Phước Thịnh ports with cold-blooded members always ready to beat those that try to escape, according to a provincial border guard. The traffickers generally don’t get caught since the majority of the victims do not report getting beaten to either the police or border guards, he said. “They control the victims with the ‘loan documents’, so it’s very difficult for the authorities to handle the situation,” a leader of the province’s border guards said. “We did try to investigate some cases but could only apply administrative measures,” he said. Colonel Phạm Văn Phong, commander of the province’s border guards, said that he is aware of the situation and has requested concerned divisions to collaborate with the authorities to investigate and track down the labour trafficking rings.